There was a live stream too. I enjoyed especially @francesc’s talk about “State of Go” which shows lots of cool changes between Go 1.8 and upcoming 1.9. It was also interesting to listen @rob_pike’s talk about upspin project. I feel interface of upspin looks cool. I was happy to come Gopherfest 2017!!! 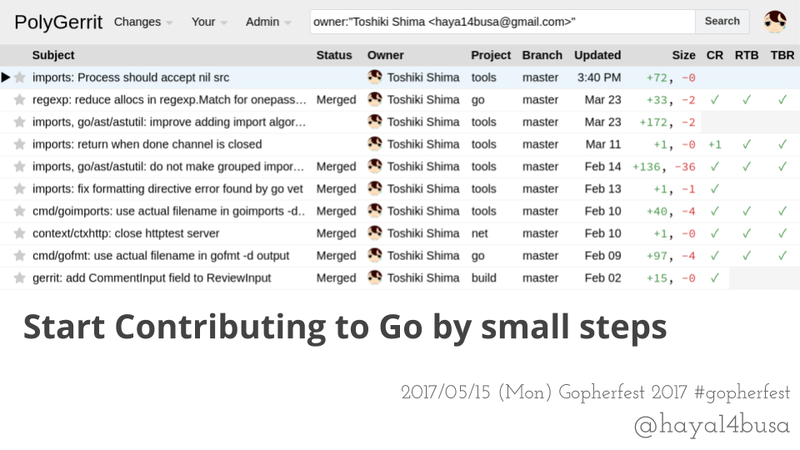 I didn’t know much about how Gopherfest works, so I prepared a small presentation in case there are lightning talks session or something. Unfortunately for me, there were no such talk session which I can dive into it, but I’ll show it here. To be honest, I just quickly translated my presentation at GoCon 2017 Spring in Japan and it might be difficult to understand by just looking slides, but I hope you enjoy it. This talk is about what, how and why I tried to contribute to Go by small steps. Here is original Japanese version, by the way. Anyway, #GopherFest was awesome! I really enjoyed it.